“Well, I never!” That’s an old phrase you don’t hear much anymore… except in old movies. It is a dated exclamation of surprise, usually at something shocking. You know the scenes from the old Three Stooges movies where Curly flirts with an attraction woman, and she turns and harrumphs, “Well, I never!” The British variant is “Well, I never did” as in, “I never did hear of such a thing!” It’s more than just an expression of surprise; it is an expression of disgust and perhaps even anger. And maybe it’s an expression of Jesus in our reading today from Mark 1. Maybe. 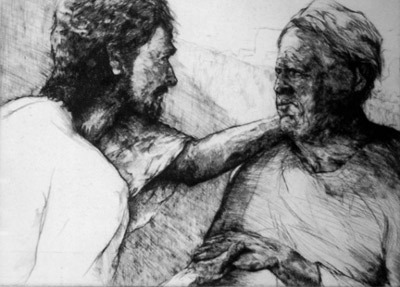 Jesus is moved with pity or compassion, and that is His motivation for healing the leper. You can read similar stories in Matt 9:36, Mark 6:34 and others where this is the case. Jesus doesn't heal just to make a big splash publicly; sometimes he heals in private just because he is compassionate. We can respond with compassion and pity for the person caught up in the sin, sickness and suffering… and be moved to help as we can. We can respond with anger at the brokenness of a world that allows such sin, sickness and suffering… and be moved to help as we can. What we are not to do is to become angry at the person caught up in sin, sickness and suffering and turn away from them and refuse to help as we can. That was the reaction that we will see in Mark from the Pharisees to the sin, sickness and suffering of the world. And their response to the compassionate and healing Christ was also an emphatic, “Well, I never.” We need to make sure we respond like Jesus and not like the Pharisees.